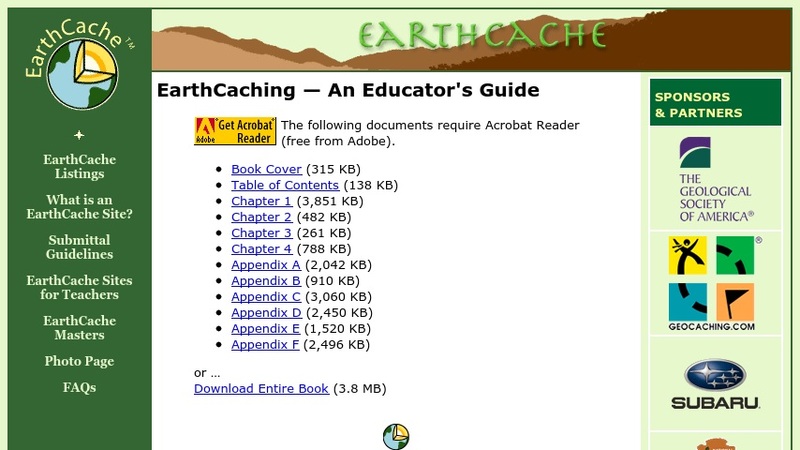 This downloadable, printable guide provides educators with an introduction to Earthcaching, a hands-on field experience in which students use hand-held Global Positioning System (GPS) units to locate and study sites with geological or Earth science interest. Topics include an explanation of GPS technology, uses of coordinate systems, the use of EarthCaching in education, and the use of the EarthCache web site to register, locate and visit sites, or create and submit a new site. The Guide also includes a discussion of equipment needs, including ideas for acquiring GPS receivers, and lesson ideas tailored to varying degrees of student access to the internet and GPS receivers.